What time is it, bronies? Its Action Time! 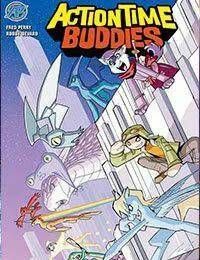 The fan-favorite internet sensation now has its own comic book!Bro the Kung-fu Pegasus, Artie the Bookworm Ninja, and Kid the Boy Pilot are out to find danger, monsters, bad guys, and the magic of friendship in their most exciting, wackiest adventure time on the playground of life yet! The action scene is just kicking into gear, so dont miss out on this exploding phenomenon!